So you knew you should have had your transmission checked, but you kept putting it off. Now, it’s 11 pm on a Tuesday and you are stuck on the side of the road waiting for the tow truck to arrive. As tempting as it may be, we’re not going to harp on you for going against your gut and refusing to bring your vehicle into Tran Star Transmission for routine transmission maintenance and a diagnostics check — but do know that this would have all been avoided had you done that. 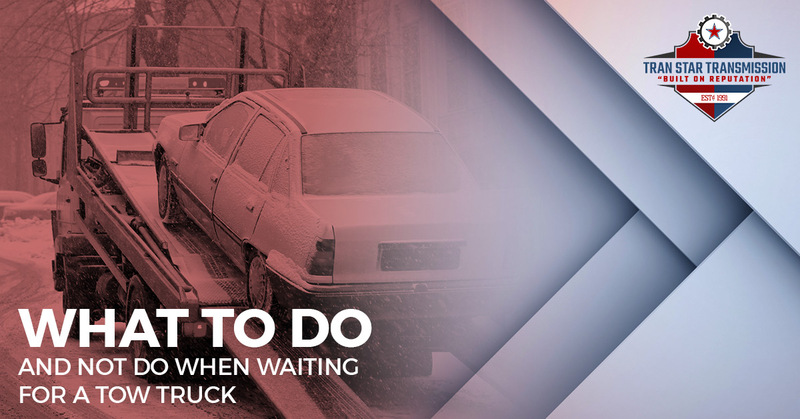 Instead, we would like to look at some of the things you should do an not do when waiting for a tow truck. If you can, once your vehicle shuts down, drive it to the shoulder of the road to prevent it from blocking traffic. Even if you have your flashers on, remember that not everyone is paying as much attention as they should be. If you do not feel safe where you are – say you break down on a busy highway – you can exit your car from the passenger side (away from traffic) and wait off of the road in the grass away from traffic. When you stop along the side of the road, you should always put your hazard lights on regardless of whether it’s daytime or nighttime. This will signal to other drivers that your vehicle is disabled. Additionally, if you have safety triangles, flares, and other safety measures, these could also be used to make yourself as visible as possible. While a vast majority of the people who stop to help you will be good Samaritans, this is not always the case. When stranded on the side of the road, you are vulnerable and should, therefore, be cognizant of this. If someone stops to help and offers a ride, be sure to be cautious and choose wisely. In most cases, the better alternative is to call a tow truck and to stay with your vehicle until the truck arrives. Whether you are hopping in the tow truck or getting a ride with a good Samaritan, don’t leave behind personal valuables. This might include your phone, wallet, purse, insurance, important documents, etc. Not only will you need these things, but you also don’t want them to get stolen. Don’t ever exit your vehicle until you’ve moved safely out of traffic. When on the side of the road, always be cautious and on the lookout for other motorists approaching. Too often drivers are not driving with the caution and care that they should be. Be defensive even when stuck on the side of the road. If you are in the Houston area and you break down because of transmission problems, be sure to bring your vehicle into Tran Star Transmission. For over 25 years, we have been providing the greater Houston area with transmission repairs, replacements, and more. Remember that a lot of transmission problems can be avoided. We encourage you to check out this blog – 5 Warning Signs of Transmission Problems – and be proactive when your transmission starts to act up. Don’t forget to stop by our shop for your free diagnostics test!